That F'ing Monkey: Flash Friday is Dead!! 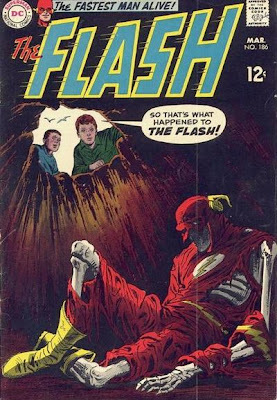 Happy Flash Friday everyone! I don’t think it is a surprise to say that although the new Flash series is a quality book I’m not happy with the re-imagining the DC Universe has taken. That disappointment has killed a lot of my enthusiasm for comics. The Flash is still my favorite superhero but I’m not as excited talking about the character in his current state. So I’m taking a couple Fridays off from talking about the Flash. There will still be updates Friday, they'll just be about other things. This isn’t really the end. Flash Friday will resume in January. I’ve done 75 Flash Fridays; there will be more of them. I just need a week or two where I’m not worrying about what Flashy topic to comment on. I also realize that a massive amount of the site’s traffic comes from the Flash topics, so please remember we do update 6 days a week with lots of other fun stuff. I hear you. It's tough to keep things going when you've lost enthusiasm. Fortunately I'm starting to build some back up with the new series, though I've also got a zillion demands on my time. Hmmm... yeah I can certainly understand your dilemna on this matter. I was on the fence with the new series and what have you. However, I have come around now that I actually have more time to pay attention to comics etc. I'll be interested to see what they do with the Rogues. Enjoy your break!